The first altitude training this year would be in Berchtesgaden, a trip booked back in October 2011, long before I crashed and disrupted my schedule towards Alpe d’HuZes. But training routine has been resumed and in the Berchtesgadener Land the Kehlsteinstrasse awaited, so off to Berchtesgaden we went! 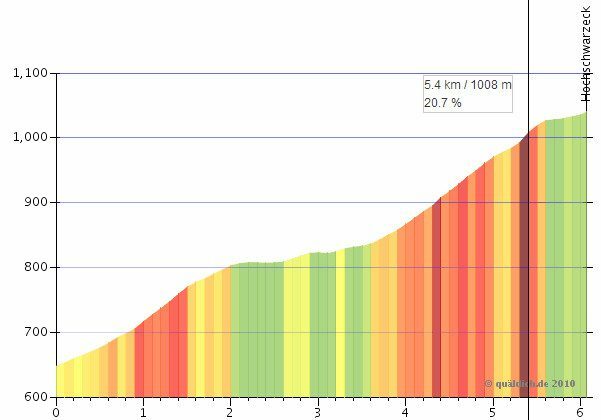 Upon arrival, I choked on my first deception: my plan to conquer that “Zoncolan of South Germany” would have to wait until some other time. The Kehlsteinstrasse was in fact still closed, as there remains a lot of (snow) clearing and road repair work to do. Yes call me stupid – I did ask the landlord if we could expect snow, because I was going to be cycling. And, probably in all honesty, the reply was that there would not be any “in Berchtesgaden”. Which turned out to be true, because there was not a speck of snow in the town, the valley, or the entire lower BGL area. Too bad that for example the Rossfeld Panorama Strasse, which also reaches up to 1.600 meters, is kept free of snow. On the other hand, that would at least be an alternative to some extent, although less steep than the insanely steep Kehlstein. Sunday afternoon was used to explore the area and not surprisingly, I discovered that the Salzbergstrasse was also closed after approximately 2 kilometers. This “entry” to the Kehlsteinstrasse also has staggering inclines of 20% and more, but I would not be able to enjoy much of that either. Before running off in despair, I discovered another supply route, running via the Scharitzkehlstrasse, at least leading up to the actual starting point of the Kehlstein. And that road was not closed, so it would be the first to climb Monday. So Monday morning, leaving the village (downhill) going into the Königseeer Strasse to turn left into the Vorderbrand, I was dead on the bike within 100 meters. The Garmin showed grades up to 24% and I was not nearly warmed up (let alone that I was expecting those percentages). Besides, although the weather was not that bad, I was dressed for the temperature (10 C) and that didn’t allow for efforts like that. After quickly getting rid of the excessive clothing, I continued my fairly exhausting struggle with gravity, interrupted by three short breaks to ease the pain and catch my breath. Yes, preparation is half the fun – my fixation for the Kehlstein and the need to improvise, clashed violently with each other. Oh well, I was here now and I was going to make the best of it. So, I rode on over the Obersalzberg- and Auerstrasse, to circle back to Berchtesgaden. In the afternoon I went back to Unterau for a trip over the Rossfeld (Höhenring or Panorama Strasse). It looks a lot less mean, but is also quite longer. And here too, “less mean” means that you can expect grades above 20% – the first stretch from Unterau is quite tough. The cyclist may struggle his way up for free, for a vehicle you pay €4.60 (plus €1.90 per additional passenger) to get to the spectacular view at the top. As I got higher, the snow banks were getting more impressive, but the temperature was not unpleasant. The descent on the other hand, was a freezing experience despite the change of clothing. Tuesday’s weather forecast was not good, but as it was dry in the morning, I got on the bike for a spin around the Schwarzecker Strasse (Hochschwarzeck). This is on the other side of Berchtesgaden, starting in Ramsau. From the profile card you can tell that you’ll climb above 1,000 meters once more and that the grades will surpass 12%. The most beautiful part of this climb is in the second half, where there’s a series of hairpins about 2.5 km from where you leave the Alpenstrasse. Wednesday brought us the promised good weather, although it soon became clear that it would be “slightly better” than predicted (it never really is just right, is it?). As I did know what to expect this time, I drove some 10 kilometers through Schönau and Königsee as a warm up. And lo and behold, the Vorderbrand Strasse was conquered without significant opposition – it remains a tough challenge, but if you know what’s waiting for you, it’s a lot easier to do. After this I went along the same route as Monday back to Berchtesgaden, but I did take on the first couple of kilometers – up to the Rennweg – from the Salzbergstrasse. In the afternoon we went to Salzburg “for a pinch of culture”, but since I’ve been in Salzburg many times I just went along for the Sacher Torte at Café Sacher there. Thursday had the Schwarzecker Strasse back on the menu, but with two extra laps on the Silbergstrasse and (especially!) the Vierradweg. There – and also on the during the first passage included Punzenweg – you really have to watch out that you do not topple over. In the afternoon the Rossfeld Strasse was climbed from the opposite direction. Here too, an additional loop was added; after the first steep climb out of Unterau, I went left at the fork (Rossfeld – Obersalzberg) towards Hallein via the Scheffauerstrasse and the Zillstrasse . That this loop was mainly downhill, came as a surprise again. 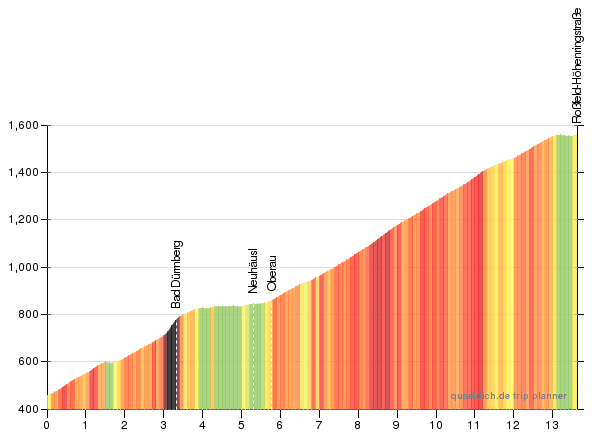 So, as a stupidity reward, I got to climb back up via Bad Dürrnberg to Oberau – and it was a nasty climb too, I might add. In the meantime, the temperature had increased to values above 30 degrees, although during the paid stretch of the Rossfeld, it was less and actually pleasant. Friday leisure day? I do not think so! 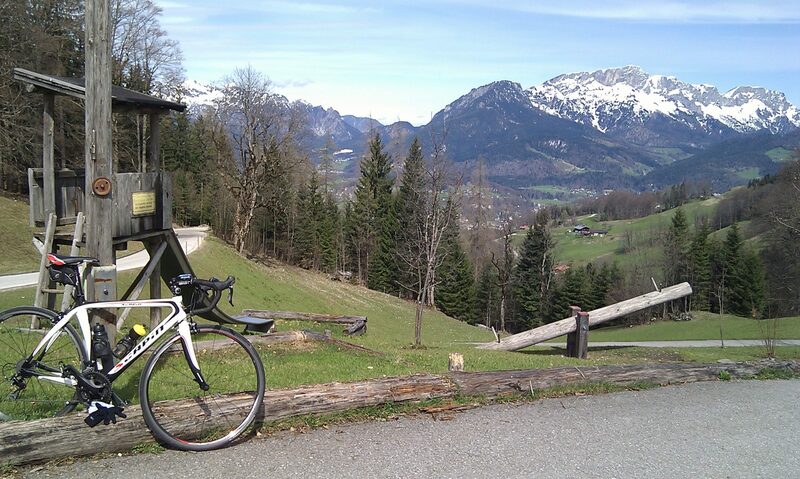 I decided to go for a longer ride, instead of returning to Berchtesgaden for lunch, but with less altimeters. So I plotted a route, which virtually circled all of the Berchtesgadener Land, except the in general less accessible National Park in the south. Of course I got lost a couple of times, but overall it went quite well. My only regret was that I missed the turn to the Gaisberg near Salzburg. I got on the ascend and followed it the first couple of kilometers from Glasenbach, but I missed the turn near Oberwinkl and ended up in Heiligenstein near the Wiestalstausee. All in all, it was a nice, but challenging and especially very hot trip. During the second half the temperatures were well above 30 degrees again, which began to take its toll. At some stage the diluted (sports) drinks will come out through your nose and on water alone you cannot make it. Luckily, from Oberau it mainly went downhill and after 115 kilometers, I put the bike back into the apartment in Berchtesgaden. Saturday morning I circled around Berchtesgaden once more, but I soon had to admit that the batteries were going dead. The heat of the last few days – with also today temperatures above 30 degrees – and of course the efforts already undertaken, were draining them faster than I could handle. After the demanding climb from Unterau, I went straight downhill towards Hallein, where I took the opposite route from Thursday (ride 6) over the Zillstrasse. This threw a surprise near 25% at me again, which I hadn’t noticed when coming down from the opposite direction. Steep yes, but not that steep. Out of breath and power, I followed the Scheffauerstrasse back towards Unterau. I really didn’t have the energy left for an extra challenge (eg. the Salzbergstrasse) and while mumbling “maybe this afternoon”, I chugged back home. Of course, it wasn’t – it isn’t – yet, plus if it would have been AD6 day, I probably would have pulled extra forces from another reservoir. But still, I’m not my old self – physically speaking, the idiocy remains unchallenged. I’ve been battered up pretty badly and it is inevitable that I’m falling behind in my (planned) training. On the other hand, in the beautiful surroundings of the Berchtesgadener Land, I cycled slopes considerably steeper than the Alpe d’Huez. And once again I had to experience the hard way that the Bavarian Alps are actually and primarily a hiking and mountain biking paradise. The surroundings are breathtaking, but on the race bike, even with a “mountain cassette”, the average climbs are just too steep. Nevertheless, it is a beautiful area and you may find “comfort” in thinking that the Alpe should be easier. Perhaps so, but even if it is, 6x that thing is really a very different level – I have some experience in the (high) mountains, so I think I know what I am talking about. Totals of the trips: 410 kilometers and between 9,000 (Garmin) and 12,000 (Strava) meters of elevation gain. 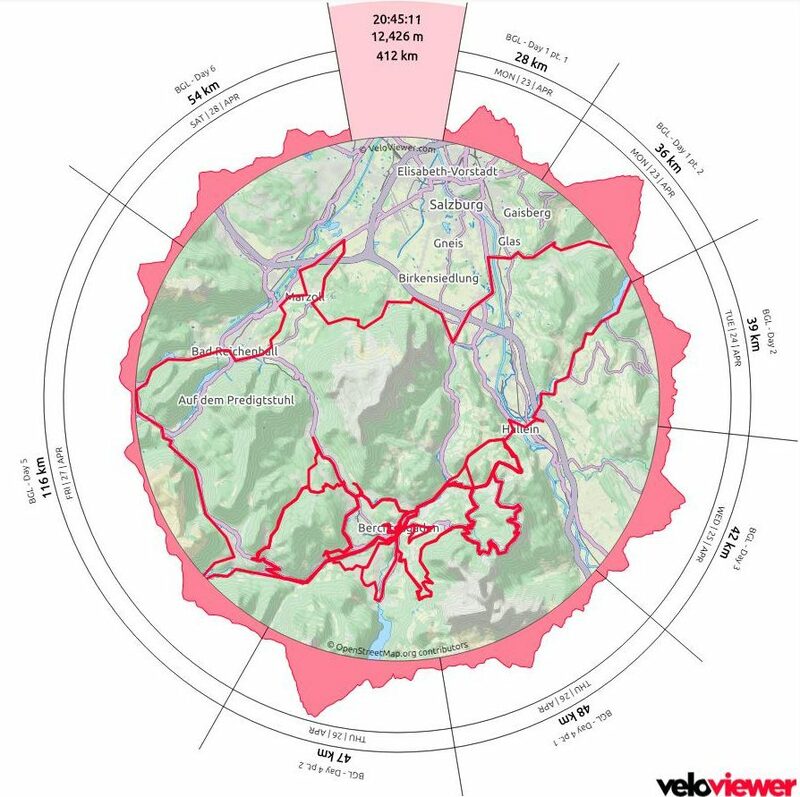 As I have seen that Strava is generally (much) more generous in calculating elevation, I’m sticking to Garmin. I roughly calculated that most (serious) elevation gain was made in some 110 kilometers of climbing, this would mean an average of 8%. In little over two weeks a new training stage: a mid-week in Les Ménuires, near Val Thorens! If the passes (especially the Madeleine) are open, I will actually get to climb the Alpe d’Huez. After that week, I will know more and it will be only two weeks until D-Day by then. Pictures on my Google+ page here – from the trip to Salzburg here.